What Muscles Do Dumbbells Work? No home gym is complete without a good set of dumbbells. The versatility of dumbbells and the amount of different workouts they can be used for make them a must have for anybody serious about working out for fitness. If adjustable dumbbells are your preference them you may well be wondering, what are the best adjustable dumbbells? 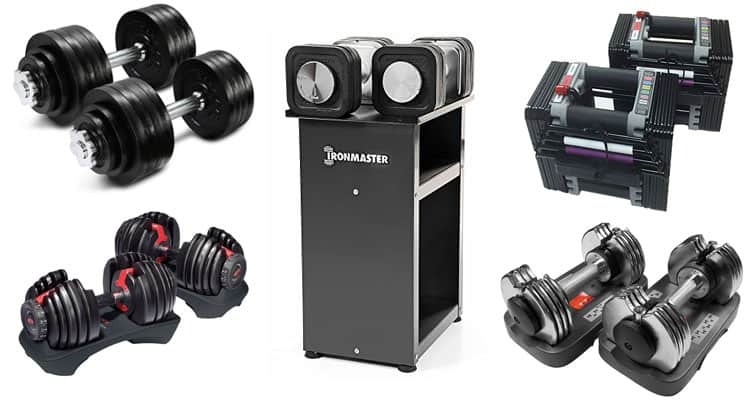 In this article we will be taking a look at the very best plate and station adjustable dumbbells in our top 5 dumbbell reviews. Furthermore we will also be sharing all the information needed to be known before buying adjustable dumbbells. For such a small piece of home gym equipment dumbbells offer great versatility. In terms of amount of exercises and muscles worked a good old set of dumbbells would be hard to beat. Below is a list of some of the muscles that a dumbbell workout engages. 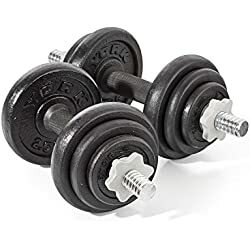 Before buying an adjustable dumbbell set there are a few things to consider first, especially if you are to get a pair that meets all the requirements needed. 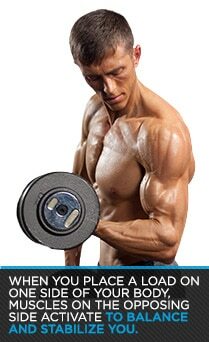 Below is a quick buyers guide on all the requirements of a good set of dumbbells. When buying an adjustable dumbbell weight set the first thing to know is that there are two different types of adjustable dumbbells. The first are the ones most people are familiar with, plate- adjustable. These allow the user to adjust the weight by adding more plates. There is obviously a limit to the amount that can be added but all you have to do is turn the screwlock. The downside to these type of weight is that if you are regularly changing the weight it can become a ballache always tightening and untightening the screwlock, which leads us to station-adjustable dumbbells. Station adjustable or selective dumbbells as they are also known, are highly versatile and perfect for a home gym with limited space. These type of dumbbells are very convenient. They take up hardly any room but have the versatility of a full rack of dumbbells. Basically it’s like having ten, sometimes more, dumbbells in one. All you have to do is turn a dial to select the weight wanted. For more information on these type of weights check our number 1 and number 2 in our adjustable dumbbells reviews later on in this article. 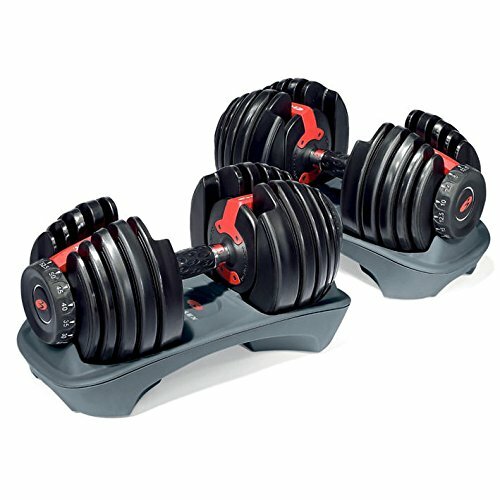 The overall weight of a set of dumbbells is very important when choosing a pair for a home gym. When buying always consider any future gains in terms of strength. There is no point buying a pair that won’t be fit for purpose in a few months. The benefit of adjustable dumbbells is that extra weight can always be added unlike with regular dumbbells. 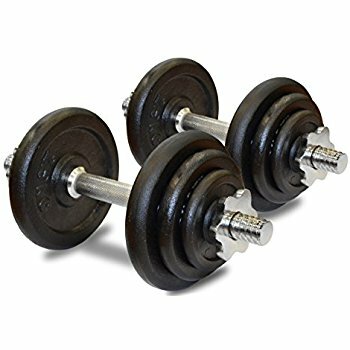 How much a set of dumbbells cost is the most significant consideration for most people when buying any of the best home gym equipment. Dumbbells and adjustable dumbbells come in varied prices. There are of course budget adjustable weight sets some of which we will go over in our dumbbell review section. Furthermore there are also quite expensive weight sets, these are obviously made to a higher standard. However not all adjustable dumbbells offer great value for money. That’s why we at Fitness Fighters have done the hard work for you. 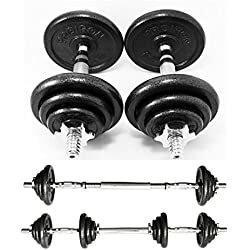 All the weight sets featured are some of the best sellers and come with very good customer feedback and reviews on Amazon. 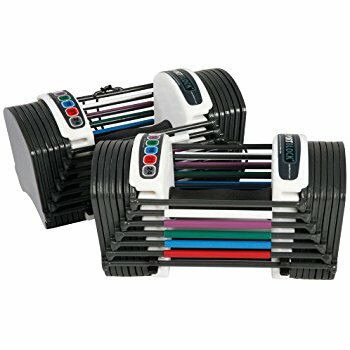 So, here are what we at Fitness Fighters and many of the customers that have bought them, Consider to be the best adjustable dumbbell sets for a home gym. All of the dumbbells featured come highly recommended and are among the best sellers in the UK. JLL are a brand with a good reputation for making all different kinds of fitness and home gym equipment and at a very affordable price. 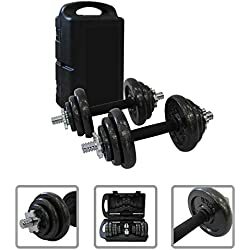 These cast iron adjustable dumbbells come with four and a half stars on Amazon and are perfect starter kit for beginners. There is an overall weight of 20Kg with these dumbbells and the set includes 4 x 0.5kg, 4 x 1.25kg, and 4 x 2.5kg plates. Those good at basic maths might have realised this comes to 17.5 kg in total, however with the added weight of the dumbbell bars and spinlocks the overall weight is 20kg. 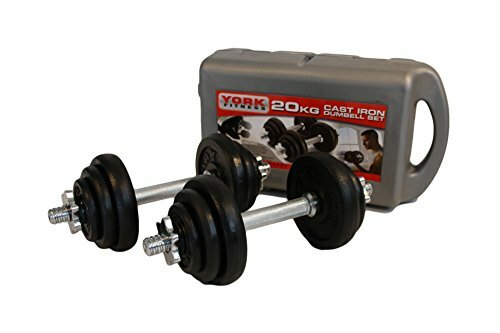 Due to these been cast iron adjustable dumbbells they are very durable and will last a lifetime. 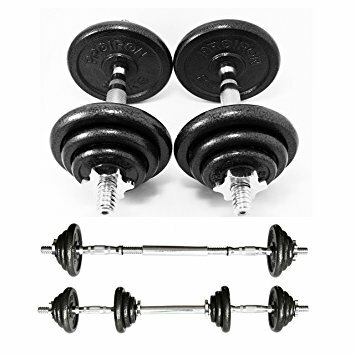 To sum up these are a good beginner set of adjustable dumbbells and at a very affordable price. York Fitness is a powerhouse of a brand in home gym equipment. 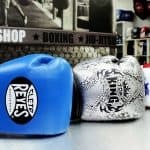 For over 80 years now they have been making high quality fitness related products. 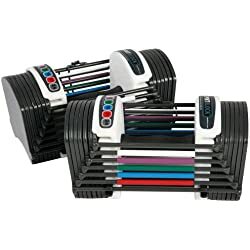 These adjustable dumbbells are one of the bestsellers on Amazon and with over one thousand positive reviews and a very respectable four and a half stars it’s not hard to see why. Positive customer feedback is always a good indicator of quality. Essentially this adjustable weight set is the same as the previous model featured in our dumbbell reviews. The set includes the same plate weights of 4 x 0.5kg, 4 x 1.25kg, and 4 x 2.5kg plates. These dumbbells do however feature a spinlock bar which is missing from the JLL set. 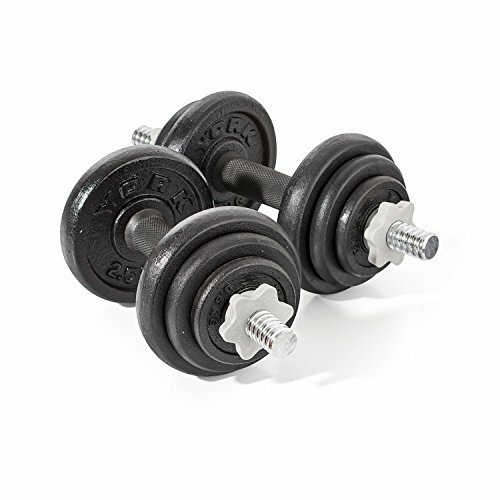 Overall a good quality set of dumbbells made from a trusted brand. The only thing to decide before choosing these or the JLL dumbbells is, are they worth the extra money for the spinlock feature and carry case because aside from that they are the same. Another set of cast iron adjustable dumbbells, this time by the ProIron brand. These dumbbells are pretty much the same as the previous two in terms of weight and plate size. However, there is the added bonus of being able to convert these in to a barbell. Due to these dumbbells coming with a connecting steel tube and adding the barbell option to a workout, these are very good for a more varied workout routine. Furthermore there is also the option to add more weights to the barbell. 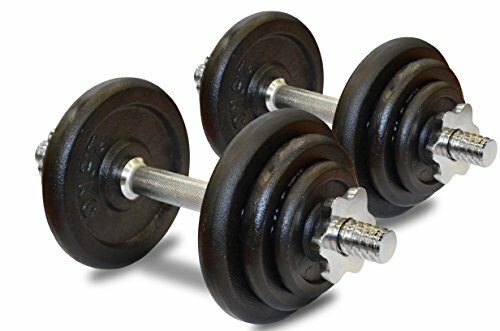 To sum up these dumbbells they are basically ordinary cast iron dumbbells with a twist. With a four and a half star rating they are well worth taking a look at if you want to add variety to a workout. These dumbbells by PowerBlock are the first station-adjustable dumbbells in our review list and they come highly recommended. With five out of five stars on Amazon and excellent customer feedback the outlook is very positive. So, let’s take a look at what makes them so good. First of all the convenience of station-adjustable dumbbells is one of their biggest selling points. 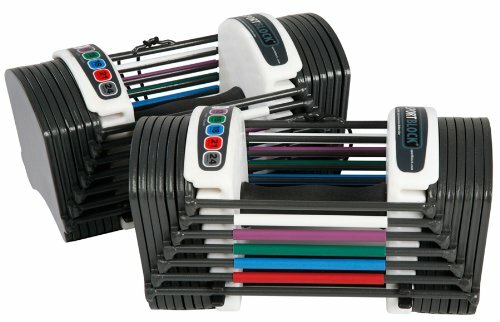 These PowerBlock dumbbells replace 8 pairs of ordinary dumbbells and give the user the option to train with weights ranging from 1.5kg up to 11kg. The full list of different weights is as follows 1.5kg, 2.5kg, 4kg, 5.5kg, 7kg, 8kg, 9.5,kg, 11kg. There is no denying that if it’s the best all in one dumbbell set that you are after then the PowerBlock Sport 2.4 weight set could be for you. The only downside is that they are only 11kg per hand. For some this may be enough but if you intend on making some serious gains then you may one day outgrow these dumbbells. 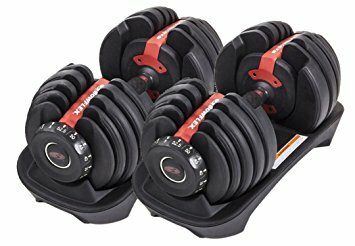 If you’re looking for a pair of adjustable Dumbbells, the Bowflex SelectTech Dumbells Set is without doubt the very best choice there is! Owning a pair of these is like having a free weights work station in your home gym, with the added bonus of taking up far less space. In total there are 15 settings to choose from, ranging from 2kg all the way up to 24kg. Choosing the weight you want is a simple process all the user has to do is turn a dial to the desired weight. Especially relevant is the Bowflex SelectTech App. This is a training tool compatible with both Android and iOS users. Basically the App gives a workout based on the dumbbell weight you are using. This is a nice touch to an already great pair of dumbbells. In addition they also throw in a free workout DVD which features over 30 exercises and 80 variations to maximise your workout. To sum up these are the best of the best when it comes to adjustable dumbbells. Highly versatile and receiving excellent customer feedback on Amazon they come highly recommended. The only bad thing to say about the BowFlex SelectTech Dumbbells is that they are quite costly. However, with that high price comes high quality. When buying dumbbells there are plenty to choose from and quite a bit of information to know before doing so. In this article on the very best adjustable dumbbells we have given all the information needed to buy the right pair for your home gym first time around. 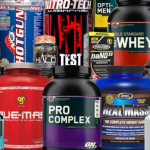 All the models featured are bestsellers and used by muscle heads all over the UK.